In 2001 Harvard Professor Henry Louis Gates came across a 300-page, handwritten manuscript titled "The Bondwoman's Narrative." It told the life story of house slave Hannah Crafts and her dramatic escape from a southern plantation by masquerading as a man. What made it so unique was that it was supposedly written during the time of slavery, and written by a woman that was herself, a fugitive slave. If it were a true story, it would be the first known work of its kind, a full length novel, written by an African American woman. The first known female African-American writer is Phillis Wheatley, who wrote poetry in the 18th century. But there was one big problem. 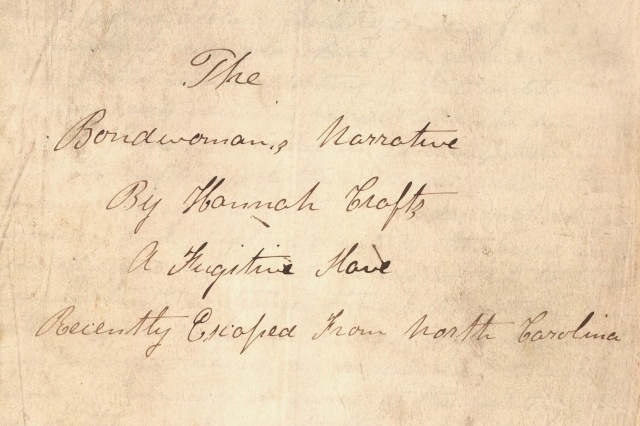 The author went by the pseudonym Hannah Crafts, and the true identity of the author couldn't be verified. The book was published soon after Gates acquired it and it became a best seller, but the mystery lingered and continued to confound literary scholars. Now English Professor Gregg Hecimovich from Winthrop University in Rock Hill South Carolina thinks he may have found the answer. "She was a slave named Hannah Bond, who served in the Wheeler family, both in their plantation in Murfreesboro in North Carolina, and in the Wheeler household in Washington, DC between 1854 and 1857," said Hecimovich on Take Two. Hecimovich took the immense research that Gates did on authenticating the fictional work, and used his locational advantage — he was working in North Carolina at the time — to interview descendants of the Wheelers and other primary sources available. "Most scholars, especially at the big universities, they're not around smaller libraries, courthouses, that are far flung from the centers of academic capital," said Hecimovich. "The way I pieced the story together has a lot to do with private papers, details from courthouse records and my connections and friendships I've made." The community in which Hannah Bond lived in Murfreesboro was home to two female finishing schools. Students from one of the institutes boarded at the Wheeler plantation. The girls were studying works like Charles Dickens's "Bleakhouse," reading the stories aloud. Hecimovich thinks Bond learned how to craft her own stories from being in proximity of these young students. "Bond would have been listening and waiting on the young ladies who were boarding at the Wheeler family plantation while they're practicing," said Hecimovich. "Ahe would have intuited, like other slaves we have record of, when she came to write her own stories she could tell her story in the way that she heard the other stories." Though Hecimovich is credited with uncovering the true identity of the mysterious author, he says his research would have been impossible without the efforts of Gates. "He did Herculean service in authenticating it, placing it, finding the historical circumstances that my work builds on," said Hecimovich. "I don't even come close to finding the story if Gates didn't set up the entire foundation."